The railway runs from the coastal town of Porthmadog to the hill town of Ffestiniog, a climb of 700 ft. The route includes a causeway, a short tunnel and a complete spiral, passing forests, lakes and a dam. 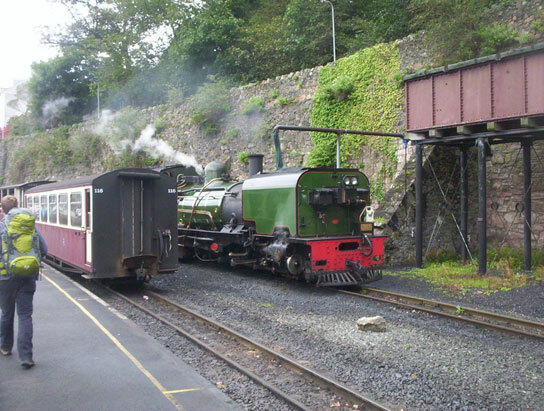 The narrow-gauge railway was established in the 1830’s for carrying slate downhill to the port, and in the 1860’s was converted to steam traction. It also carried passengers. The slate industry declined and the line closed in 1946. Volunteers and enthusiasts re-established the railway from 1955. By 1982, the track, including the Great Deviation to avoid a new hydro-electric dam, reached a new narrow gauge/standard gauge interchange station at Blainau Ffestiniog. 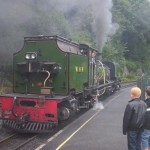 Today it is a popular tourist attraction, connecting with Conwy Valley Network Rail trains at Ffestiniog and with West Highland Railway narrow-gauge trains at Porthmadog. The views from the train are often spectacular, and at the upper end of the route parts of the original trackbed can be seen. There are useful-looking stops en route. Railway buffs can admire the unique double-ended steam engines and the period rolling stock. Practical Notes: Parking in front of the Porthmadog station is extremely limited, but there is pay parking nearby, e.g behind the nearby supermarket. There is parking at Blainau Ffestiniog station. Hard-up families may note that there is a Porthmadog – Ffestiniog double-decker bus service, which presumably provides a scenic route at much lower cost. 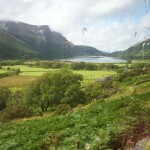 The Conwy Valley Network Rail route is said to be very scenic. 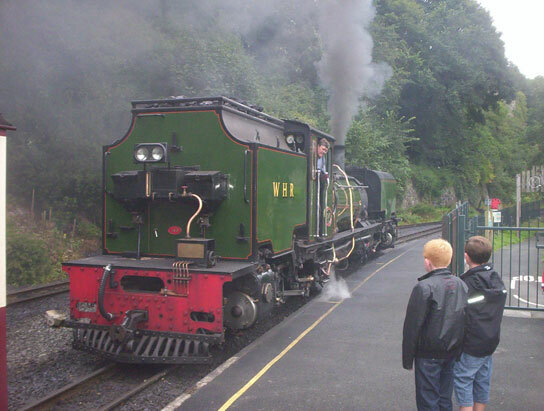 You could make a railway-themed day out by starting from Porthmadog, taking the connecting Network Rail to Betws-y-Coed, visiting the miniature railway museum beside the station, etc, and then returning. 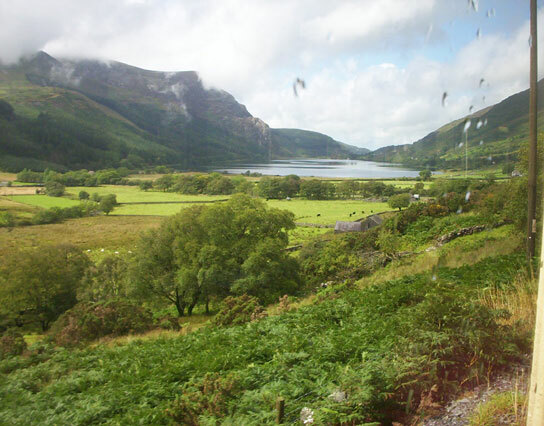 The Welsh Highland Railway is a narrow-gauge railway that runs from Caernarfon to Porthmadog, a distance of 25 miles. Part of the journey is over a former standard gauge trackbed, the rest over the original narrow-gauge trackbed. The steam engines are from a South African narrow-gauge line. At Porthmadog, tourists can transfer to the sister Ffestiniog railway. I booked a ticket for the first trip of the day for: Caernarfon – Pont Croesor- Caernarfon. I could have gone to Porthmadog, but that trip, at an extra 2 ½ hours, including a lengthy stopover in the coastal town, did not fit in with my plans for the day. I had a walk around the outside of Caernarfon castle before catching the train, which was pulled by a 2ft gauge articulated South African steam loco. The trip out took just over 2 hours. The first bit of the journey is dull, but once up in the hills the views are spectacular. The track curves a lot, so that one can look out on the bends and see the far end of the train almost side on. That train actually terminated at Pont Croesor for some operational or timetabling reason, with a diesel shuttle covering the last leg of the journey to Porthmadog. I waited at the station around 20 mins, and caught the same train back. There was a technical failure of brakes on one coach at around Beddgelert on the return. After a lengthy delay the last two coaches were disconnected and the train proceeded. At my hotel I met a party of train buffs who were visiting all the narrow-gauge railways of Wales. You don’t have to be that dedicated to enjoy a trip on this line. Even if you are not interested in steam trains, the Welsh mountain scenery and the sharp curves and gradients of the line are a sufficient reason to travel. Unlike most heritage steam railways, this line is promoted as part of an integrated tourist transport system, and not as a destination in itself. The line runs from Paignton to Kingswear, running briefly along the sea coast before cutting acros the peninsula and running some way alongside the Dart estuary before terminating at Kingswear. It connects with First Great Western trains at Paignton, with a ferry at Kingswear, and is also offered as part of a train-boat-bus circular tour starting at Paignton, and other permutations of train and boat. On their website they claim that “This is one of the finest heritage steam railway journeys anywhere in Europe.” It’s not bad, but having travelled on both, and not being seduced by the romance of steam travel, I can point out that the First Great Western line served by diesel railcars from Exeter to Paignton is longer, has a more spectacular coastal route, and is (with a cheap day return) cheaper. I’d recommend using the steam railway as part of a touristy day out. There are old places to look at in Dartmouth, including a small castle, and a river trip up to Totnes is one of the best river trips around. The line runs 18 miles from Pickering to Grosmont, with a total of five stations. There is a connecting service onwards to Whitby on the coast, also apparently steam hauled. Network Rail trains serve Whitby and Grosmont too, but the tickets may not be valid on both services. For the enthusiast, the stock book lists about a dozen each of steam and diesel locos, and several dozen coaches and wagons. The website says that on some dates services are available along the Esk Valley line, which runs from Whitby via Grosmont to Battersby – a 24 mile run, but I couldn’t find any timetable, so if you are interested you should telephone them. FYI, the Esk Valley line is normally used for the Network Rail Whitby-Middleborough service. Of the stations, Pickering is a tourist destination, with a castle, Goathland is the film set for “Aidensfield” in a well-known TV series, and Whitby is a port and seaside resort, and folk festival venue. The NYMR base is at Grosmont. I remember breaking my journey at Goathland for a lengthy walk which stretched my enthusiasm for walking far beyond its limits as I tried to reach some now-forgotten goal. There is a pretty gorge with waterfall near Goathland which is a popular destination for walkers if I remember correctly. This railway is worth a visit whether your interest is fired by tourism or a passion for steam trains. Also known as the National Railway Museum, York. For a train buff, heaven would probably consist of a day here, plus a ride on a steam-hauled mainline excursion train. There are about 100 locos, 200 other items of rolling stock, and hundreds of thousands of other objects, everything from rubber handstamps to turbine powered railcars. The museum has free admission, and is a couple of minutes’ walk from the York mainline rail station. It’s possible to walk to the museum from anywhere in York town centre in about 10 mins. 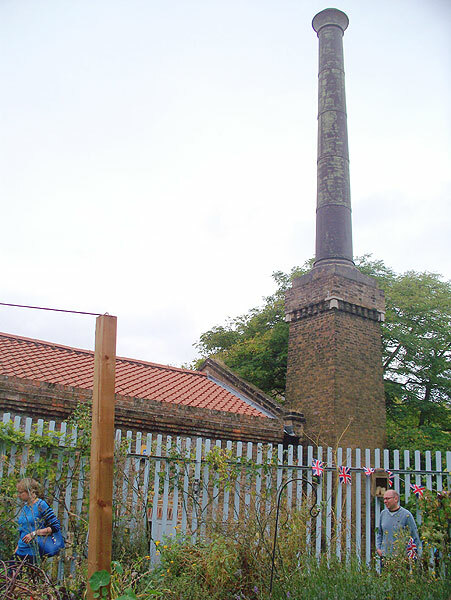 There is a car park in Leeman Road adjacent to the Museum. If you think the daily parking charges are a bit much, you could take a bus from your accomodation to the centre of York, or use the ring-road park and ride from Rawcliffe Bar or Askham Bar, from where services 2 and 3 should drop you outside the museum. Central York during the day is not a place you want to be if you are a car driver. (I was staying in the suburbs of York and came in by bus). BTW, there is another branch of the NRM at Shildon, Co. Durham. The collection there includes the Advanced Passenger Train. This is a narrow-gauge railway, re-created over part of an old route near Exmoor. The route is quite short, and once you’ve ridden the train and had tea there probably isn’t a lot else to do. The rolling stock includes two small steam locos and one diesel. Worth a visit when combined with other attractions in the same area. This is one of the more minor preserved railways. Three and a half miles of track runs from Chinnor (the only station) to Thame Junction, in the direction of Princes Risborough. Sunday is the principal operating day, and some trains are steam hauled. Curiously there are no steam locos on the stock list, but they have a 0-6-2 tank on loan (Sept 2011). 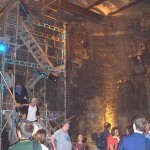 Worth a visit if you are nearby visiting other attractions in the area. Once you have ridden on the train there isn’t much to do except ride on it again. This preserved steam railway runs from Bridgnorth to Kidderminster. There are 6 stations and about 16 miles of track. It recreates the feel of railway travel of a past era quite well. The line has been prone to landslips, and if I remember correctly, there were places where the train trundled slowly past the greenery and one could see trackside fittings that had obviouly moved several feet laterally. Near the tracks there are various things to look at, including The Engine House, a new museum and visitor centre, and touristy stuff in the towns along the line. The line now carries around 250,000 passengers annually. At one time there was an annual folk festival at Bridnorth, and they had a Folk Train excursion to pubs with folk music sessions in a couple of picturesque towns down the line. We got to play music on the train too. You could have a similar inebriated outing – just leave out the folk music. The Nene Valley preserved railway has seven and a half miles of track running between Peterborough and Yarwell. There are five stations and a 617 yard tunnel. 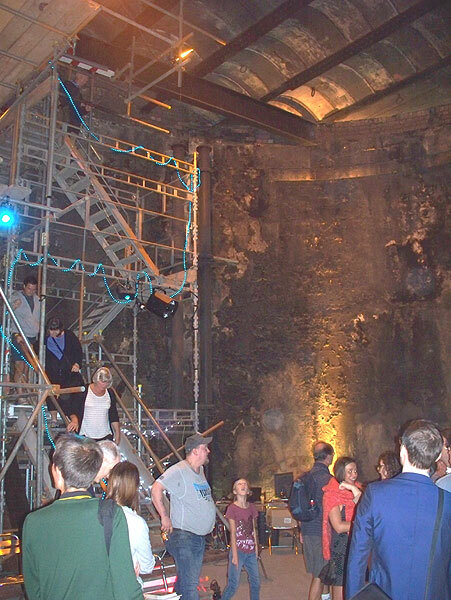 I don’t remember the tunnel, but I do remember the Polish tank engine and the unusually bumpy ride. Unusually, the railway was re-constructed at the time of re-opening to the Berne continental loading gauge, so that it could use the available European engines and rolling stock. The list of locos and rolling stock is quite long, and includes both Continental and British examples. The principal station and NVR HQ is at Wansford, a popular starting point. All Day rover tickets are available. Attractions near the line include the Nene Valley Park, Peterborough Cathedral, and “Railworld”, an independent rail museum.